Do the Seahawks need to add a pass rusher? It pays to be cautious in August. If a player is carrying even a slight injury, it’s not worth risking. So the growing list of players sitting out during training camp isn’t a major worry. Yet. The thing is though, it’s become a familiar sight. Seattle’s injury reports last season often contained numerous names. The Seahawks were not only missing several key players on injured reserve — the ‘survivors’ were also the walking wounded in 2017. Hopefully this won’t be a problem come week one. It’s mildly alarming though that already several players are nursing injuries. The healthiest teams are often the ones that succeed in the NFL. Seattle hasn’t had one of the healthier groups for a few years. And then there’s the pass rush. It was already pretty thin. Dion Jordan’s continuing absence is making it a critical issue. Frank Clark is a quality young pass rusher. He’s also struggled for consistency so far. Becoming ‘the guy’ instead of being #3 to Cliff Avril and Michael Bennett might be the responsibility he needs to take the next step. Let’s hope so. Yet after Clark you’re looking at the likes of Barkevious Mingo, Marcus Smith, Branden Jackson and rookie Rasheem Green. Shaquem Griffin might add something as a nickel pass rusher but it’ll be a situational role at best. This has to be a concern. At least if the team has ambitions to be seriously competitive in the NFC West. A lack of proven quality would be eased somewhat if the Seahawks had a quality interior rusher. They don’t. Is it a situation they’ll simply hope to manage? Will they take a look at some veteran options? Do they consider a trade? It’s hard to know what the options truly are. A year ago they were very aggressive to go after Sheldon Richardson and then Duane Brown. Do they have buyers remorse following the Richardson rental? Do they have a different mindset this year? Twelve months ago did they go big to have one final push with the LOB era defense? Are they playing more of a long game these days? Or is it just about opportunity? This week ESPN posted a typical pre-season piece. It discussed a ‘trade candidate’ from every team. Click-baited up to the nines, impossible not to read. ‘Click me, you know you want to‘. And everyone does. We all do. Even though there’s barely any chance of a significant trade before the season begins. Wait, what? Sure, the 2016 NFL Defensive Player of the Year who made NFL history a year earlier by being named first-team All-Pro at both defensive end and outside linebacker is a foundation piece for the Raiders. But his holdout, which reached 10 days on Monday, is mystifying to many in the organization. Now, would it be smart for Oakland to trade the face of its defense as it begins a rebuild under Jon Gruden? Probably not, but as Gruden himself recently told NFL Network, the Raiders’ defense was not that good in 2017 with Mack. Ouch. GM Reggie McKenzie (jokingly?) asked me at the NFL owners meetings in March if I had an extra $100 million to help him pay Mack. If a team dangled two first-rounders and, say, $8 million, the Raiders would be wise to listen. I’m not sure anyone is ever going to pay two first rounders for a non-quarterback. Mack, as brilliant as he is, turns 28 next February. If he was two-years younger it could be a possibility. He’s one of the few defensive talents worthy of a big splash. Yet if Oakland truly doesn’t see a possible resolution with him — and with Mack’s contract expiring at the end of the season — they might be open to some form of compensation. It would still be a bizarre move. It makes too much sense for Oakland to find a solution here and keep a fantastic player. They have $43m in free cap space in 2019. This should be as much of a no-brainer as an extension for Aaron Donald. Unless you’re willing to pay DeMarcus Lawrence or 30-year-old Ziggy Ansah $20m a year, free agency might not provide a solution for Seattle at the end of the season. Both players are very good but is Lawrence special? And is Ansah’s age a problem? If they wanted to use their +$50m in cap space on a new pass rusher, those are the two best options (if they even reach the market). A deal for Mack would be more expensive and cost a draft pick — but there’s no doubting his placing at the top of the NFL’s best defensive players. What about the draft? It could be an exceptional D-line draft in 2019. 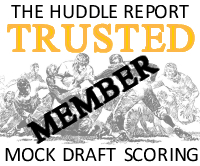 Tony Pauline at Draft Analyst has given fourteen players first or second round pre-season grades. That’s before he’s even covered the PAC 12. Seattle should be able to find a pass rusher or two that they like (and new names always emerge during the season). Whether they can find a talent like Mack, however, is a major question mark. Ohio State’s Nick Bosa is an incredible player. Possibly better than his brother Joey. He should be the early favourite to go #1 overall next year. Are the Seahawks going to be in range for him? Unlikely. Houston’s Ed Oliver, Rashan Gary and the Clemson quartet will also go very early. So then it comes down to what you want. Do you prefer Mack and a huge +$20m contract or a cheaper rookie with no proven NFL quality? There are positives and negatives to both scenarios. Mack and Clark would be a formidable duo in 2018 though and could provide the foundation, with Bobby Wagner and K.J. Wright, for a new era of defense in Seattle. This is really just a thinking out loud session. It’s fanciful to even think Oakland would do a deal. Would they consider a first rounder plus Earl Thomas? Maybe. But safety isn’t Oakland’s most pressing concern. It’s pass rush support for Mack. And a trade weakens a problem area further, it doesn’t solve anything. Nevertheless, it feels like the Seahawks have to try and do something to help their pass rush. Pete Carroll told 710 ESPN yesterday he expected Seattle to be very good at defending the run. He was especially firm on that subject. There’s also a lot of hope and optimism that the running game will be fixed and that Russell Wilson will be his usual excellent self. However, the pass rush has become increasingly important for success in the league. There’s nothing quite as frustrating as watching your offense put points on the board and then the defense struggle to get off the field because the opposing quarterback has all day to throw. We’ll see if there’s some help available before the season begins. If not, they might just have to wait and see what the 2019 draft has to offer. It will be the year of the D-liners. There is quite a hit-and-miss nature to the position though. Just ask Dion Jordan and Marcus Smith. So if they can land some proven quality, it might address an increasingly problematic need. It’s funny, but this was exactly what I was looking to read this morning and couldn’t find any of the other Seahawks or sports sites talking about the Seahawks need for a pass rusher…then I click here and there it is! With Jordan out for a while, I think they have a significant need. But I;m not sure they have a replacement on the team. So other than Mack, what outside options are out there? Is there a potential trade partner? What about free agents…anyone else we haven’t heard about? Thanks again for a great site Rob, always insightful stuff here! I can’t see many appealing options. Cut day might provide some options. People might suggest Dante Fowler but his career hasn’t taken off and he’s had some off-field moments. Not sure that’s a road to go down. Shaq Lawson too. And I understand that neither one of these guys have lived up to expectations, but there are exactly the kind of low risk/high reward moves at the Seahawks seem to want to take this off-season. Not really trying to convince you. My thought general thought is that I don’t think the Hawks are going to be willing to do the splash trade (for a variety of reasons) but would be willing to buy low on talented guys who never really lived up to their potential. I remember them being linked to Lawson pre draft ’16. He never caught on in Buffalo. Maybe he could be had for cheap. Shoot, he might even get cut, to believe the reports. Fowler is less likely but maybe a possibility. This is the strategy they’ve employed recently with Jordan ans Marcus Smith. I could see it happen again. I agree Lawson is the type of player they have targeted for reclamation in the past. Look no further than Dion Jordan, Barkevious Mingo, and Marcus Smith. All first round pass rushers who flamed out with their first team only to be signed on cheap deals by Seattle. I would give Lawson a similar deal if he is cut. I would also trade a 7th for him. Rob, another name mentioned in the ESPN article you linked is DE Carl Nassib of Cleveland. If I recall correctly you identified him as a potential Hawks draft pick predraft based on measurables. What do you think of his performance in the league this far? Do you think he is someone Seattle might target in a trade to boost defensive end depth? I’ve not seen Nassib in Cleveland to be fair (not many of their games make the TV over here!) so not sure. I think just as a TEF reference guy. Pretty interesting on Hard Knocks though. Well, seeing how a playing like Coleman just went for a 7th in 2020, it wouldn’t take much at all possibly for someone like Lawson, so I agree that if it’s cheap like Coleman was, it would be well worth it. With the secondary loaded with newcomers, not having that pass rush is going to be huge. The Hawks may have to blitz a lot more to overcome it. Or, maybe someone like Jefferson or even Jackson will jump up and have one of “those years” where everything clicks. One of the downsides of football is the injury aspect, and it’s something that’s impossible to predict and with a salary cap, it really limits stocking up with good depth. The Hawks did glean both Bennett and Avril later on, so there is always a chance a vet will become available, but yeah, it’s paper thin right now. I’m pretty happy with our DT rotation and I actually think it will be one of the positives on the D this year. Since the Hawks are not a SB contender this year, I say let this be a talent development year. We are accustomed to being in the playoffs year after year and that is not a realistic expectation. Even the best teams (Pittsburgh, Green Bay) have years when they don’t make it, and that’s when they reload with high draft picks. In a year when the Hawks are not close to contending, they should not force a trade that sacrifices their long term growth ( like they did last year). Be smart, play with who they have, let the chips fall where they may, and use the high draft picks to get better in a few years. I’m not sure it would appeal to Oakland. If they’re going to pay either player it might as well be Mack. If we acquire a DE we should “go big or go home” we have plenty of good DE’s what we need is a Hall of Fame DE. Honestly I’m not sold on Clark being a consistent pro bowler, I’m more confident spending $$$ on WR Locket. Why not trade Mack for Clark? Mack should understand how much $$ he is saving by leaving Cali for WA. If we do that kiss KJ Wright goodbye next year! Shaquem allows us to blitz from the weak side and Mingo & Martin Allows us to blitz from SAM. Mingo & Martin add 2 DE’s to nickel & Dime packages. Mingo & Shaquem should be best in the league Blitzers by far, go luck finding 2 guys better! Tough call…if you could get Mack without letting go of a high pick, then go for it. But if you are talking ET + 1st rounder…I just don’t think this team is in position to do that. I’d rather overspend next offseason than lose draft picks at this point. They will certainly have the cap space to do some damage. At least don’t lose premium draft stock on top of it. I think the minimum it would cost would be a high pick. Oh yea…I was thinking it’s an interesting scenario if it’s a R3, R4 + Earl…but I don’t see that happening unless they get desperate. The Hawks will need to add a couple of good pass rushers & hope for continuing development of the in-house guys to get a championship caliber defense on the field. Don’t see that happening this season. Well the Colts traded two 1sts for a LB……our very own Fredd Young back in the day! I would rather pay Mack $20 million than Clark at $15 million. They could afford both if they decide not to extend/re-sign Lockett and/or Wright. Without a 2nd, would hate to lose next year’s 1st, too. Need more young/cheap talent to supplement the stars. Thompson, The Griffins, Jones, Reed and Green are a good start. …Yeah, I would trade ET + 1st for Mack…in 2 heartbeats. We can’t give up our 1st in 2019 because it will our best chance in years to have a shot drafting a true 1st round 3 tech. Oakland currently does not have the cap space this year for ET unless they trade or cut some players but even if they do that they would have to get ET on a friendly 2018 contract. Two options I thought that might be intriguing and perhaps possible are Emanuel Ogbah and Jamie Colllins from the Browns. Both pre-Dorsey additions and he’s proved that he’s willing to get rid of players if it suits. Both have very nice athletic profiles; huge arms, good size, sub 1.6 10 yard split and explosive jump numbers. Ogbah hasn’t really lived up to expectation and Collins has been a train wreck the last few years. Not saying it’s likely or anything but it wouldn’t be outside the realms of imagination to see these guys on the team. Great piece Rob! If it costs us draft picks plus ET, I say no. As much as I like/want Mack, it seems that would be the move to make last year, which they did for their last LOB push last year. With so many new pieces, I think they are expecting a year of transition, not contention to win SB. On the other hand, seeing as Oakland faces the same problem as us, I wouldn’t be upset if the reverse trade happened here at DE. Trade Frank Clark to Oak for a second and third.. I know that’s an unpopular idea, but while he has been good, he has also been inconsistent – Clark will want $15Mill/yr. Of course the numbers he puts up this season will matter a lot – he just hasn’t put it all together yet. Reason why the trade might make sense is because you’d get more out of it (and sooner) than the third round comp pick if they’ve decided they’re not going to extend him. I don’t think either trade scenarios happens, but as Rob said, just thinking out loud here. Given the nature of what this season is for seattle (rebuild, retool, reload) I would think they stay away from any splash trades. Id like to see them pick up a vet somewhere and get by this year. We may have to just blitz the hell out of BWags, Wright and Griffin to create pressure for now. Especially, given the pass rush in 2019, i think a crazy Mack trade would be uneccesary (id hardly be upset if they pull it off though.) One option that might be fun is to use some 2020 capitol to get into the top 10 and draft one of those studs to pair with Clark in the future. Or we might just have a top 10 pick anyway, although im not expecting that at this stage. I want to see if any of those other guys can step up before pulling the trigger on a huge deal like that. Maybe if by the trade deadline we are in a unexpectedly good spot and think we will be contending sooner rather than later. Not sure though about not having a R1 or R2 this year, especially when so many pass rush options will be available. I think if the question marks shift from the offense to the defense, this off season was successful. Carroll will get his defense to a competitive level. Championship level competitive? Probabaly not. If the offense is balanced and can execute running plays when they want it will help everything. I love all the youth. With proven players you have expectations and like Carroll said there were very high expectations for certain players and they couldn’t follow through. I feel like after Carroll lost his players confidence after sb49 none of the players on defense were playing up to the expectations that were set for them by contracts or previous performance. I love the young group on defense and am glad to be moving on from the whinny millionaires. Whinny millionaires don’t win Super Bowls, go hawks! Personally I’m not experiencing any issues. So I don’t know what the problem is or whether there’s a fix. Exactly. As Kenny says, no big deal, just trying to help identify the problem. In case it might help, I’ve also noticed that the “Name” and “Mail” fields which normally remain filled automatically are emptied every time after I post a comment, and the URL does not scroll me down to “#comment-123456” as it normally does, because the comment is not yet visible. I have also tried other browsers besides my usual Chrome (Firefox, Edge) and found the same issues. Same here. It was nice having my login all filled in and ready to post, now I have to enter it every time. Me three, just assumed my comments were being screened because I’m a jerk. Hey Rob, if Tedric Thompson excels in preseason do you think the Seahawks will continue on with Tedric as the future FS and forget about Earl’s situation? Earl is a few months away from leaving Seattle whatever happens anyway. Love Earl and we’ll always have the memories, but if he holds out into the regular season I think he should be benched whenever he does come back. Sure, it sends a message, but more than that I just don’t see how it helps us to let someone — even someone as talented as Earl — take half-hearted snaps away from those who are here battling to be a part of the future in Seattle. If we were in a Super Bowl window that’s different. But being honest, we’re not, whe’re building another core to create a future Super Bowl window, one that Earl clearly won’t be a part of. We need to see what Tedric Thompson can do. It should be his job until someone takes it from him, and that goes for Earl as well as anyone. You’re either in or you’re out. If we have a strong start we might be happy ET is still on the roster! Also if ET continues with his Hawk bashing Hawks could decide to really put the screws to him, there’s no guarantee ET will pass Hawks physical when ET decides to show up. The possibilities are still endless. Regarding the pass rush, I think the players to watch tonight are likely Rasheem Green, Poona Ford, Nazair Jones, and Jacob Martin. Martin could be an interesting dark horse off the edge. He’s a tiny end but has interesting bend. My hunch is that they want to see what these guys do before making a move on a veteran. Can they get inside pressure? How does Green look with the ones? Does Martin do more than flash? Surprise! I guess I’m going to the game tonight! Who else is gonna represent for SDB there tonight?? I bet JS/PC has eye on few DE from other teams just waiting for roster cuts. Most likely unsung veteran low risk but player with high upside. Elephant in the room: This conversation probably wouldn’t be happening if Seattle had found a trade partner and taken Landry in the second and picked up RB depth with the pick accrued. I mean they still got a RB/DE combo, just not in that order. We would still have the same depth problem. In my scenario, we’d still have RB depth, but we’d have Green and Landry. It wasn’t worth loosing Penny & Schneider said that’s what would have happened! For the 1st time in years we had a shot at a 1st RB so we took it. The other RB’s not including Barkley were not 1st round RB’s. I did not see a 1st round RB in the draft – Barkley, so I mocked Austin Corbett because he was more Important than a 2nd round RB. When it comes to Hawks draft you gotta live & die by their method obviously we don’t want go back to the Pre Carroll era. I’m willing to admit Pete Carroll & John Schneider know more about football than I do. I just don’t see why you would ever consider giving up 1st round draft picks and 20m a year for Mack, I mean, I would rather see us give up first round draft picks to move up in the draft a pick up a stud like Bosa and have him on a 5 year team friendly deal. I think to move up and get Bosa you’ll be looking at two first rounders plus a lot more too. Real chance he goes #1. He’s the real deal. Best player in this class. Minus Bosa would you trade up for any other DL/DE? I’m big on Ed Oliver personally. Ed Oliver is also really good. Nice personality too. Will be up there, likely top-five. Bosa’s on another level though. We have compared the current WR corps to the WR corps of the Super Bowl era teams. RWs first year we had Avril and Red bryant. Is the current pass rush worse then that? I don’t think so. Surely recognize that the team didn’t make the SB that year, but they were definitely successful. So maybe there is t a “need” for a change as much as a desire for one. Take it if it comes approach I suppose! BC S Lukas Denis (5’11, 185 lbs.) is one of the better zone coverage safeties from this potential class I’ve seen so far. Like this guy a lot. Just a ballhawk with outstanding read/react (recognition) skills Had 14 plays on the ball (7 INTs, 7 PBU), to go along with a 49.6 passer rating when targeted. 83 tackles from the FS position ain’t too shabby either. The way it looks now and lots could change, I haven’t even come close to checking them all out, but its not the best safety group. Big drop off after Denis, Udub’s Taylor Rapp, Florida’s Chauncey Gardner, the dude down at Miami, and Miss St’s Mark McLaurin. The pass rush was a well known concern going into the draft. Frankly, they didn’t do enough to address it, instead choosing to make fixing the run game the top priority. Some here have suggested they could find pass rushers easily, but I didn’t see it then and still don’t feel that way now. Hopefully the run game is better, but they won’t have much opportunity to showcase it if they can’t rush the passer, and the opponents rack up big points, and force the Seahawks to pass a lot to play catch up. In fairness Penny + Green is a LOT better than Harold Landry and whatever RB they could find in round three. Rob, interesting points about injuries. I have not seen any analysis on the subject, but it seems to me (anecdotally) that success on the field during the season is significantly correlated to good luck with injuries. Have you seen anything written about that? Thanks! I haven’t but it makes sense. No. The Seahawks do not need to add a pass rusher. They need to add 2-3 pass rushers. Unfortunately, they won’t because, outside of QB, penetrating DTs and upfield DEs are silly hard to find. Pass rush became an Achilles heal two years ago even though we had Bennett and Avril. Now it will be even tougher to get off the field on passing downs. QBs will have ample time to exploit a young secondary. Therefore, prepare for Blitzburg Northwest. And as much as I truly love Mack, we’ve got to stop robbing Peter to pay Paul. We need to protect our draft capital. This class is filled with stuff that’s really hard to find. Top LTs all throughout the 1st likely, top DEs all through the first 2 probably, and some nice DT options. Personally really like Raekwon Davis, and expect him to be a name we see draft nerds talking about sooner than later. Could be Ironic that we finally have a solid O line and a less than stellar Dline. That’s terrific news especially after Carroll’s comment on Johnson. I Hate Jerry Jones but after watching the Cowboys I’m concerned trading ET to Dallas would be a huge mistake, they looked good! Wait, wait, wait… Indy at home was hardly a real test. I safely predict, the Chargers will roast that “solid OL”. We have one sold first round talent player in Brown. We have a perfect second round talent RT, but he will play LG. We have a halfway capable RG, a player once named as the worst first round pick of 2016 because of his 6th round talent, who plays RT and accumulates penalties. We have a center who got paid and played a horrible 2017 season. Fluker is huge, but inconsistent. And above that, we have just crushed our LT depth pick by letting him play RT. The rest plays on a level simply not NFL capable. With the players we have, we could have a perfect OL. But as long as Positive Pete manages the OL as it was another secondary,shuffling players who need experience and confidence at their position, it will not work out. I’m not saying, that we will loose games down to that. I wonder, how that game had ended, if Luck and Russ had fired it out. I know it is just the 1h of pre season but really like the offensive design on the first couple of drives. Running Carson behind Fluker on 4th and 1 was awesome to see. Watching Cowboys Niners game, Niners are testing Cowboys secondary. Cowboys look good everywhere except FS. If Cowboys had ET I think they could have a SuperBowl run I’d give up a 2019 1st round pick for ET if I were them. However after watching Cowboys I’m not sure I’d trade ET I need to watch Tedric play before I’m on board with that trade. Is it just me, or are the Colts double teaming Ponna a lot? And he’s holding anchor almost every time? Draft class showed pretty well. It’s the first preseason game but cool to see a draft class make a positive first impression. This team is going to fight every play. They seem gritty and ready to punch someone in the teeth. Vannett is coming along and building his rapport with Russ. And Dissly looks really good too. TE room should be just fine in catching and blocking. Hill is a stud. I’d almost rather have him .on the field than Thompson bbut McDougald being best at SS is likely the difference. Russ looks very healthy and fast, was he hindered last year from his 2016 season? Also, Russ’s legs will be a huge part of this offense, and rightfully so. QJeff is going to make the 53, so is Poona Ford. Swoopes sealed the edge in red zone runs. Caught the ball ok too. yardage. Depth was shallow. Odihambo is not good. Don’t put too much stock into these snaps. Shaquem really struggled in coverage and didnt want to stack and shed, but he’s got a great onfield communication on D.
Poona Ford ate up blockers all night. Even allowed Shaquem to penetrate for that huge TFL. Rasheem Green played extremely well. Showed speed around the edge and I think beat their starter for a pressure or sack. I didnt know Prosise was out until he wasn’t in. Ifedi didnt get a penalty and didn’t stick out. Pocic moved really well and seems well ahead of Joey Hunt. Jordan Roos could almost start imo. Curious to know what Pete thinks of Vannett. Not convinced by him. Seems to be a lot of drama there and he hasn’t been the same since the injury.